With the unbearable heat, there is nothing more wrong than neglecting the beauty routine since just in this time of the year the skin needs more care and attention, the important is to choose the right products. At the moment my daily routine is very easy, just six quick steps, using all the items I featured above. The Avène Thermal Water is my must have of every summer, I especially enjoy using it after having cleansed the face and just before the day cream. Both NYC bronzers are great and cheap: the first has a matte finish for contouring, the second one is shimmery for a slight glowing effect. The lipstick is my fav of the moment and I highly recommend it: it is from an Italian brand, Bellaoggi, very affordable and good; I picked an intense coral, it is creamy and long lasting (no joke, it could stay for all the day, even after meals, as a tint). Have you ever tried any of these products? What is your summer beauty routine? Any good product to suggest? Praticamente la mia beuty routine!!!! Adoro i prodotti della Avene sono buonissimi!!!!! Un bacino Lilli e buon week! lo voglio provare quel rossetto! Per il resto hai la mia somma invidia, riesci a non essere pigra e ben organizzata, io non faccio praticamente nulla e si vede! My beauty routine is quite simple. I use L'oreal peeling/daily wash with scrublet, Nivea creamy make up remover and Olea tonic and daily cream on daily basis. I don't wear much make up in summer, right now just Essence mascara and Avon lipstick (sometimes but not very often also Essence shades). I don't use any foundation, BB cream or bronze at all. Because I had some allergies and problems with my skin (seborrhea), I make sure to moisture my skin a few times a day (by applying face cream). There were several daily creams which I used in the last few months and I would recommend all of them (Afrodita for sensitive skin, Rosay for sensitive skin, Eucerin for sensitive skin) but I like to change my face cream every month because once my face gets used to it, it doesn't work that well ( and I end up with seborrhea again) So right now I'm using Olea. In addition, I do body peelings quite often and right now I enjoy trying out DIY ones ( with coffee and etc). I like to try home made face masks and stuff. L'acqua Avène la uso sempre! Tutti ottimi prodotti! anch'io cambio la mia routine in base alle stagioni. D'estate uso solo una crema da giorno con filtro solare alto, un fondotinta leggerissimo con filtro solare 15 di Koko, mascara e matita nera per il trucco. Per la pelle uso bagnoschiuma riparatore, crema doposole e acqua rinfrescante. Hi Lilli, excellent choices, I also used to use Garnier face products and I was really happy with it. The lip shade is striking, it must look even better on. Love that bronzer, I want to get it now. Thanks for your visit, Happy Weekend! L'altri prodotti purtroppo non ho provato ma il rosetto mi sembra bellissimo! Ottima routine per l'estate Lilli! Vorrei provare quei prodotti della Garnier. Great post Lilli. I have been wanting to try out the NYC Bronzer since it's so affordable. Dear Lilli, in the summer month i use not so much products for my face. One of my must have product is also the Thermal Water from Avène. This water has a special place in my refrigerator.Sp the thermal water is even more refreshing. For my make-up i just use also bronzing power, mascara and a lipstick. Your whole day stay lipstick sounds great. Thank you for a view in your bathroom routine. Ciao Lilli. La mia beauty routine è molto simile alla tua. La crema viso di Garnier la uso anch'io e mi trovo bene. Un bacio e buon fine settimana. La crema di Garnier è davvero ottima, la uso anche io (soprattutto di sera) ed è perfetta per l'estate, molto fresca! Bello poi quel rossetto, devo provarlo! Hi Lilli! In summer I usually wear little makeup and for me it is essential to use sunscreen, kisses! Io con le creme Garnier mi sono sempre trovata molto bene! Simple is the best, Lilli and I am aN Avene fan too! Have a great weekend! I have tried Cleansing Gel from Garnier and thermal spring water from Avene and I think they are great. My daily summer routine is rather similar to your, after face cleansing I use lavender tonic and then well moisturizing cream (now it's daily cream from Organix Cosmetix) and using long lasting lipstick and good masacra is the most important point of my summer make-up. you had me at affordable! I love your routine. I have been looking for a good bronzer for a while Lilli, therefore, I will definitely take in count your recommendations about the NYC bronzers! ( now I hope I can find them in Latvia or order them somewhere online!). 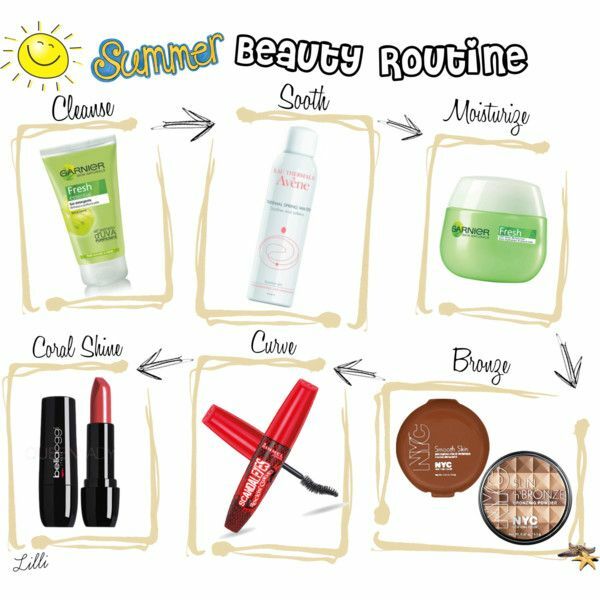 I really liked this post, Lilli- I can see you put some thought into it & it was definitely fun to read about your summer routine! Ottima routina Lilli, adoro i prodotti de Avene! Un bacio tesoro. Wowie, I would love to try the coral lipstick, it sounds abolutely amazing! Enjoy a fabulous weekend my dear! These are wonderful items for Summer Lilli. I adjust my skin care and make-Up Summer too. A little bronzer will be fun for Summer. Have a wonderful weekend Lilli. You have an awesome skincare system Lili! Garnier is such a good brand and I love that lippie color. Coral is so pretty! I love oranges and corals. Great Summer system doll! All the summer beauty products you have shared are lovely - here we have to wrap up and moisturize to keep the skin looking good. Going from a warm room out into the cold can be hard on your skin. ok prendo tutto grazie! adoro Avene che per la mia pelle delicatissima e' fantastica! belle proposte, il mascara e' il mio preferito Lilli! I agree. No need to wear to much makeup in the hot summer! ma che bello questo set! sei stata bravissima a crearlo, Lilli! il rossetto corallo è proprio bello, se è quello che ti ho visto qui a volte sul blog e che ti sta benissimo, è sciuramente da trovare! Non conoscevo il brand Bellaoggi, non l'ho mai notato in giro. Devo fare una ricerca! Thanks for these awesome summer beauty tips Lilli! I really will give the Garnier products a try very soon....have a great Summer!!! Thanks for sharing your routine! Mine is the same all year long and includes many more steps. It's time consuming but it's worth it. un bacio e buona domenica Lilli!!! I've tried many products from Garnier and I liked it, now I use some local products. They look like very nice products Lilli! I haven't tried them, I'll keep them in mind. Lovely routine Lill! I also don't use too many products and like to make my skin breathe! Thanks for sharing Lilli! I also swear by the Avene Thernal Water spray and keep a small one in my purse to refresh/moisturize my face when I'm out. I'm using the regular Rimmel Scandaleyes now and this Rockin Curves version you have intrigues me. Hope you're enjoying a lovely weekend sweetie! As you have mentioned, in the summer, like in any other season we have to take care very well of our skin. I prefer to use a light face cream who won't make me look oily and I don't forget about the SPF creams. My favorite is Bioderma AKN Mat with 30 SPF. Io voglio assolutamente provare la nuova crema idratante di garnier, tu come ti trovi? Credo che gli step che suggerisci sono gli essenziali e per fortuna d'estate sono anche sufficienti. Io in più metto proprio sempre la crema protettiva 50+. buon inizio di settimana dolcissima lilli. Che dire? Una beauty routine perfetta, fresca leggera.... d'altronde il tuo viso parla da solo!!!! cute collage! :) I love the coral lipstick! Sono curiosa di provare il mascara, sembra ottimo!